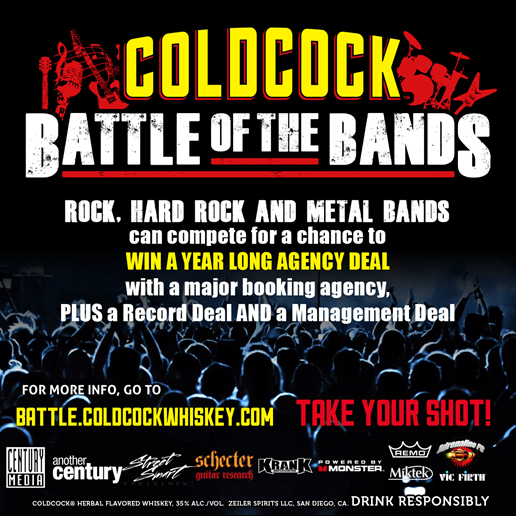 COLDCOCK American Herbal Whiskey is announcing their first-ever official “Battle of the Bands”, offering unsigned bands the chance of a lifetime: a year-long agency deal with one of the top booking agencies in the industry! Additional prizes will include a Record Deal with Century Media Records/Another Century Records, a Management Deal through Street Smart Management, COLDCOCK Whiskey-branded Schecter Guitars, a Sponsorship deal with KRANK Amplifiers, custom REMO Drumheads, Miktek Microphones, Monster Products prize packs, Vic Firth drum sticks and more. This unique “Battle of the Bands” contest is designed to actively give up-and-coming artists hands-on experience with representing themselves professionally in the industry. WHAT IS THIS ABOUT, AND HOW DO I ENTER? The contest takes place from May 1, 2015 until August 31, 2015. All band members from participating bands must be 21+. See what our judges have to say about the COLDCOCK Battle of the Bands! Don’t miss out – sign up now for your chance to win these great prizes! COLDCOCK American Herbal Flavored Whiskey is the world’s first and only herbal whiskey and is a fast growing shot brand in the spirits industry. COLDCOCK is touted by hundreds of bands, artists and personalities such as DATSIK, Pepper, The Expendables, Eyes Set to Kill, Sevendust, Attila, Drowning Pool, Upon a Burning Body, Texas Hippie Coalition, Mushroomhead, Nonpoint, All That Remains, Jamey Jasta of Hatebreed, Sam Bettley of Asking Alexandria, Dan Jacobs of Atreyu, Big B, Terravita, Smile Empty Soul, The Supervillains, The Vegabonds, We Came As Romans, Bobaflex, Warner Drive, Beebs and Her Money Makers, Fatally Yours, Blue Felix, Comedian Don Jamieson, Tattoo Artists Steve Soto and Paul Booth, Graffiti Artist RISK, and many more.